I don’t sleep well. I live in the middle of a noisy city and shouts and sirens wake me up in the night. More recently, because I am now Of A Certain Age, menopausal hot flushes wake me up a few times a night. Waking up is ok but then my bladder wakes up and once I’ve got up and had a pee, my brain wakes up. I’m an expert worrier and I often get flashes of inspiration in the early hours of the morning, so once I’m awake, getting back to sleep takes an hour or so. I’ve tried various strategies, listening to boring podcasts about philosophy just got me really into metaphysics. HRT had so many side effects for me it wasn’t worth it. Meditation helped a little and acceptance of this new way of polyphasic sleeping helped most. I just slept in chunks. It was ok. To keep me on the good side of sanity I’d take a knock out sleeping pill once every six weeks or so. Zopiclone is horrible stuff, it left me feeling poisoned and slightly hungover, and it didn’t really cut through the hot flushes anyway, it just left me feeling numb. Here is where the CBD oil comes in. I’d run out of sleeping pills and booked the next available appointment at the doctors (which was two weeks away) to get some more. It was on a whim that I tried some CBD oil when it was suggested by my favourite fruit and veg shop – Chi Wholefoods. I was in there buying every calming herb I could get my hands on – valarian, vervain and oats to make night time tea with. Chi have an amazing zero waste shop where you can weigh your own stuff. CBD oil is legal in the UK and in some areas of America. The CBD oil I bought came in a paste and I needed to squeeze out a little bit the size of a grain of rice. I didn’t have many expectations so it was glorious when I had a really good nights rest. I have no control over the outside world and nothing will stop the hot flushes. What the CBD did is take the edge of anxiety off it all, so my brain didn’t kick in and sabotage me. I woke up, went for a wee and was back asleep in a few minutes! When you don’t sleep well for a few years and then get a decent rest it makes you feel terrible, so the next few days were not fun but I did start to feel a little more human. This is what life must be like for people who can sleep! Amazing. Now I’m getting one bad nights sleep a week, which is a big change from the 7 bad nights I was used to. I don’t take the oil every night, only when I remember. I kept my doctors appointment because I wanted to check over the CBD oil with her and she was totally fine about it. She said if I was getting on with it there was no reason to stop and she was glad she didn’t have to write me a new prescription for Zopiclone. It comes as a thick liquidy oil, a paste, a spray for lower doses or a balm which works well on aches and strains. It seems like it is good for almost everything but for me, it has made me less anxious with no side effects. I’m not a zombie on downers, I’m not stoned, my judgement is not impaired, I’m no more alert. I just feel like me without some of the worry and stress. Anxiety is linked to hot flushes in a horrible wicked cycle – you feel anxious, you flush, flushing makes you anxious, you flush more……… The CBD oil has reduced my hot flushes and really made radical changes to my sleep quality. We are all different. What works for me might not work for you but it seems sensible to start with the lowest potency and work up if that doesn’t work. Bristol CBD gave me some of their 3% oil and it did nothing for me. I gave what was left in the bottle to a friend who said she is “blown away by it’s effects”. The double benefit of starting low is that the lower percentages are the cheapest. My sweet spot is the 5% version which I bought using my discount code “less-stuff20” from ww.bristolcbd.co.uk . I’m not a doctor so if you are breastfeeding, pregnant, on any other drugs or whatever please check with an actual qualified doctor before you try it. I am not responsible for your well-being and I am not responsible if you are one of the very rare people who reacts badly to it. Googling “bad reactions to CBD” brings up reports that say it is not well tested or regulated so it is really important to buy from a reputable stockist. The risk can be that some of the trippy element of the original cannabis remains in the oil, which can increase anxiety. And it doesn’t look like it plays nicely with epilepsy drugs. But check with your doctor first if you are worried. For me, I think it is much safer than the very addictive sleeping pills I used to rely on. Bristol CBD have full lab reports on their website and I trust that kind of transparency. I take a couple of drops of the oil just before bed. I also have a 14% paste for when things get really bad, before a big day or when I’m worried about something more than usual. For normal days the 5% oil from Bristol CBD is perfect for me. It tastes bitter and the taste stays in your mouth so unless you like 90% cocoa chocolate you might want a spoonful of something to counteract the taste. I like it. Dosages will vary, try a small amount and build it up. There will be a recommended dosage when you buy it anyway and that will depend on how it is presented, as an oil, paste or spray. If you get your CBD oil from www.bristolcbd.co.uk use “less-stuff20” at checkout for 20% off the order & free delivery. That makes the prices undercut anything at the major health food stores in town. Bristol CBD have excellent reviews and you can read what mainstream media are saying about CBD in the Guardian, Cosmopolitan and Independent. You can find them with the hashtag #BristolCBDOil as well. 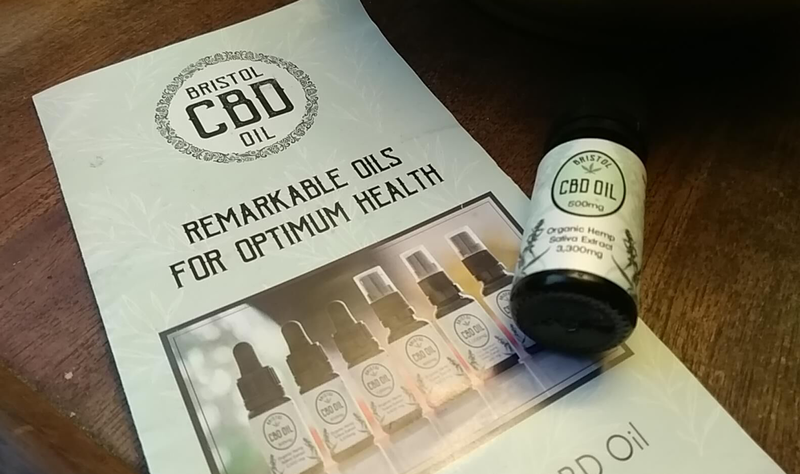 Disclosure – Bristol CBD gave me 300ml of their 3% CBD oil. I bought a stronger version from them using my discount code. If you use my discount code I may get a small affiliate commission.